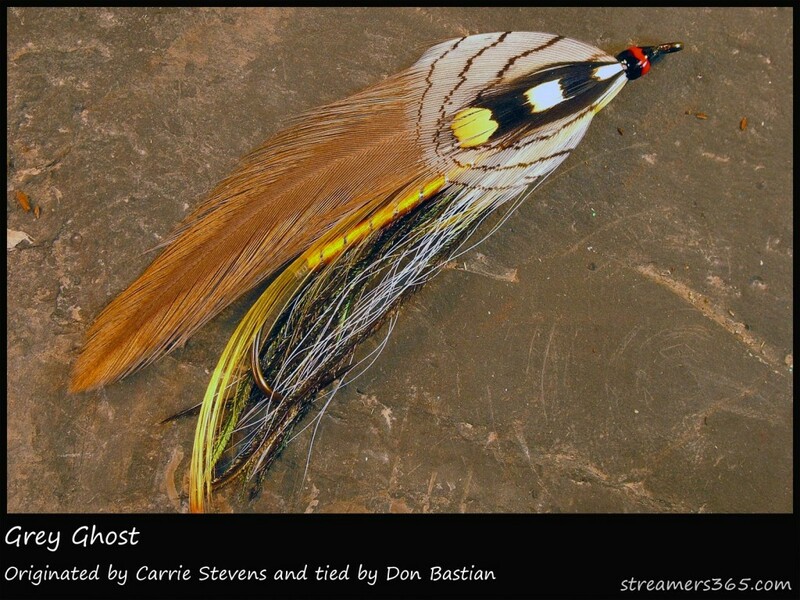 February 1, 2012, on Streamers365.com, Darren MacEachern’s site for an ambitious feather wing streamer project, the Gray Ghost from several tiers was featured. This version in the photo below was one I tied used some bronze tinted hackles that are from an older rooster cape. In the Carrie Stevens book by Graydon Hilyard, there are several Gray Ghosts tied by Carrie Stevens with hackles that are almost a perfect match of these, that is why I chose to use them. http://www.myflies.com/Traditional-Streamers-and-Bucktails-P622.aspx MyFlies.com offers secure and convenient electronic online ordering. Your order for this DVD will be received, processed, and shipped by me, so your order receives my personal attention. Signed copies of the DVD are available by request. It is interesting to note, the Bates book on streamers, specifies a red banded head on the Gray Ghost, but the Carrie Stevens book, by Graydon and Leslie Hilyard, with many photos of this fly, shows them all with an orange band, so I have adjusted my Gray Ghost heads to be banded with orange from now on. Carrie Stevens specified that the wing, belly, and golden pheasant crest underwing should all be as long as the wing. This entry was posted in A) - MyFlies.com, Fly Pattern Recipes, Streamers and Bucktails, Traditional Streamers and Bucktails and tagged Carrie Stevens streamers, Don Bastian Fly Tying, Gray Ghost, Graydon Hilyard, Leslie Hilyard, MyFlies.com, Streamers365.com, Traditional Streamers and Bucktails. Stunning fly Don. I wish a company like Whiting would dye some olive-gray hackles. There is no reason they shouldn’t. I know I would buy some. I love this whole fly, outrageous job! Thank you very much Kelly! I appreciate the fact that you are a dedicated follower of my blog, and always am flattered by your kind words, thank you so much! The hackles on this Gray Ghost are natural, not dyed. There is more of a rusty dun shade, but still, very similar to some of the feathers of wings on Gray Ghosts tied by Carrie herself. You did a wonderful job with the wing color. One of my favorite images is the group of GG on the back of Hilyard’s book. the range of colors used in the wing can be seen clearly. Personally, I like to see the ginger color come through. It makes for an elegant grey. Thanks Darren, I thought the same thing, and the photo you are referring to on the back cover of the Hilyard book; this wing color is a dead-on match to some of those flies. No need for the boot. ;-) I always sign the DVD orders that I ship personally. There may be a delay due to my recent 9-day hospital stay, but I’ll try to ship as soon as I can. Thanks for your order!